Posted on September 19th, 2018 . 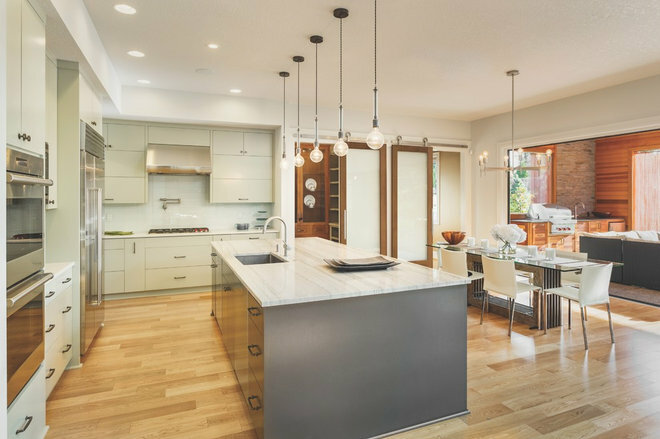 What are tall and flat, often have a surface area of around 800 square feet and are mostly ignored when designing a house? Your doors. Exterior and interior doors are wonderful opportunities to make an impression and showcase your style. Much like art, they can add beautiful panache to your home. Interior designer Janie K. Hirsch and architect Elias Kababie share how to unlock this powerful design statement throughout your house. Consider a fun pop of color, an unusual shape or unexpected hardware. The teal blue shade of the door seen here packs a punch, yet it’s classic enough to work with the beveled window and dual decorative panels. Other front door options include frosted glass, double doors and paneling. 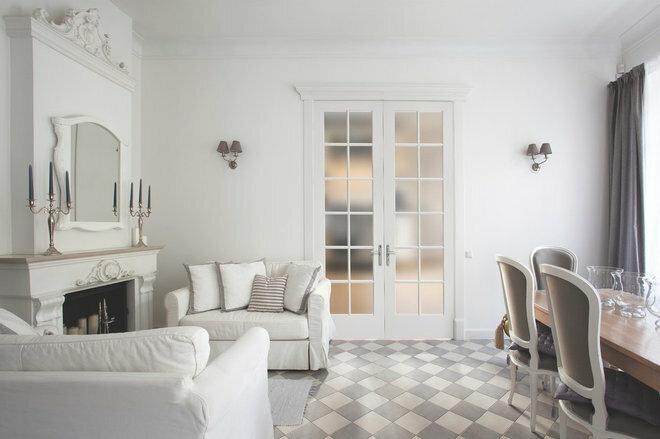 “A door shape that I love that’s rarely seen is an arched door, either as single or double doors,” says Hirsch, who owns J. Hirsch Interior Design in Berkeley Lake, Georgia. Also keep in mind what you need most from a bedroom door: privacy and noise reduction, Kababie says. This bedroom door’s sleek, subtle details and solid profile complement the home’s Scandinavian style while providing privacy and a sound barrier to the stairwell. The simple, single-panel barn doors in this kitchen suit the transitional-style slab cabinetry and straight-lined hardware. “Sliding barn doors are great for a visual impact, when you have the wall space on either side of the door frame,” Hirsch says. View doors as an additional decor piece, whether you use your dining room nightly or just for special occasions. Consider, for instance, a flat-front single door in a vibrant hue, an intricate glass door or a barn-style door with impressive paneling. The French double doors seen here — with decorative molding, classic hardware and frosted glass — set a glamorous tone in this dining area. An added bonus? “A double door makes it very easy to get furniture and other things in and out,” Hirsch says. Also, thanks to the glass, the doors separate the room without making it feel closed off. 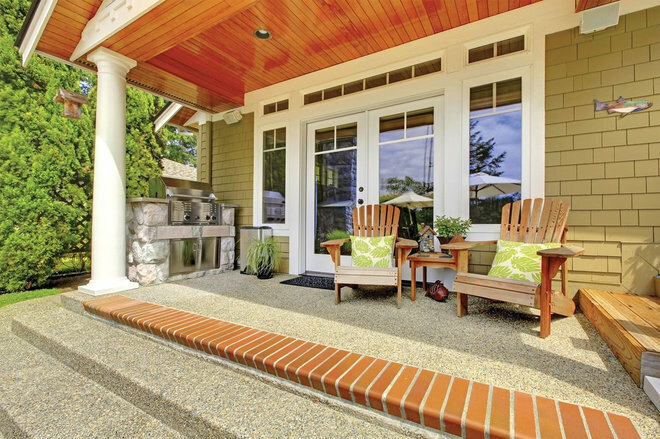 Install glass exterior doors to enjoy your yard even when you’re inside. Designs such as the double doors seen here — with large glass inserts and side panels — offer garden views and natural light and let you keep an eye on outdoor activities. Bifold and sliding glass doors are two other good options. “Patio doors should be a mix between privacy, security, trend and design,” Kababie says. 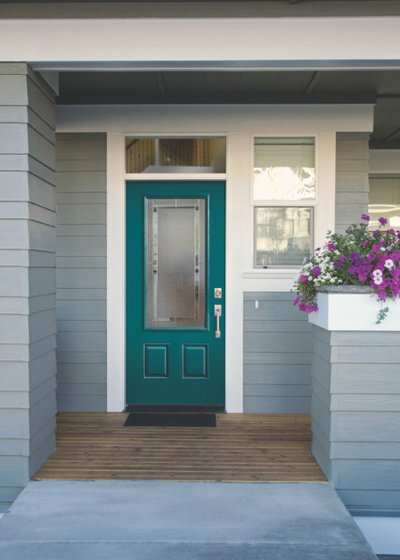 Now that you’re aware of the key design element your home might be missing, all you need to do is select your favorite door styles, colors and hardware. Chat with your designer or a specialist at your local hardware store to get started. More: To learn more about Masonite Doors and its designs, visit the company’s Houzz profile.